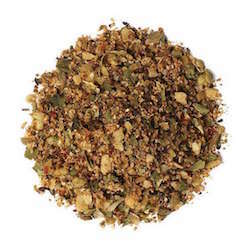 Vegetable Seasoning offers just the right touch of savory flavor for whatever dish you're making. Toss any kind of vegetable with a little olive oil and vegetable seasoning to taste. It also works great as an all-purpose seasoning. Ingredients: Organic onion, garlic, black pepper, sea salt, cumin, bell peppers, coriander, oregano, cilantro.